The quiet town of La Fortuna is famous for the majestic Arenal Volcano. Whether you desire to stay at an eco-friendly bungalow or an upscale resort, we hand-picked the best choices. 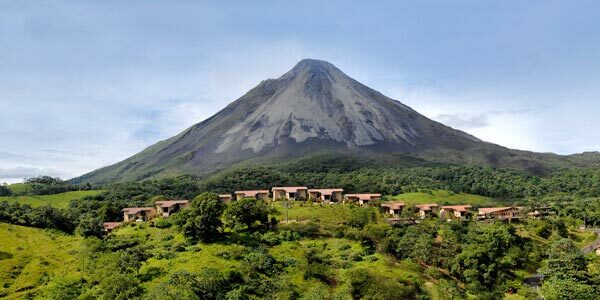 Stay at Amor Arenal for a luxurious and secluded experience by Costa Rica's most famous volcano. Enjoy a haven of peace and gardens while lounging at the on-site hot springs. Experience nature and quiet at an unpretentious location. Ecologically committed to its surroundings, Casa Luna provides a quiet and peaceful stay in a family-friendly location. The Arenal Volcano in Costa Rica is one of the most popular tourism attractions in the country. The hotels, lodges and resorts in the area as diverse as the landscape of the region. You will find upscale 5-star resorts in Arenal area in the form of luxury bungalows and resorts, as well as more rustic, eco-friendly lodging. Our team has selected what we feel to be the finest in both terms of service and facilities. To start with the best, Arenal is home to some of the best hotels in Central America, and you don’t have to take our word for it, Arenal Nayara is repeatedly voted number one hotel in Central and South America and even number 4 in the world by different reputable travel magazines! Luxurious personalized service like no other goes hand-in-hand with the seclusion of Nayara’s ‘casitas’ (bungalows), sprinkled among lush tropical gardens, with excellent volcano views and intimate outdoor jacuzzis. What more is there to ask for? Well, there’s also exquisite dining, wine bar full of fine choice worldwide select wines and indulgent spa experience! 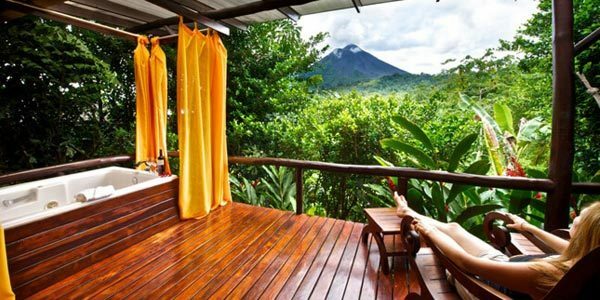 On the other hand, The Springs Resorts and Spa, Arenal Kioro, Royal Corin and Tabacon all offer on-site private hot springs set amid stunning tropical gardens, relaxing and soothing spa experiences and great choice of international dining options. Trying to figure out what’s best for you by just looking at those photos and descriptions can be a tough choice—our travel consultants now them inside out and will gladly help you pick out what’s best for your travel personality! Also, there is an excellent choice of boutique hotels, somewhere where you’ll feel less crowded and more in touch with nature, which include eco-friendly hotels like Mountain Paradise, Silencio del Campo, or out-of-the-way but quite unique Rio Celeste Hideaway. Family, budget-friendly options among hotels in Arenal Costa Rica, with great amenities, Arenal Manoa, Arenal Springs Hotel, Volcano Lodge and Lomas del Volcan.